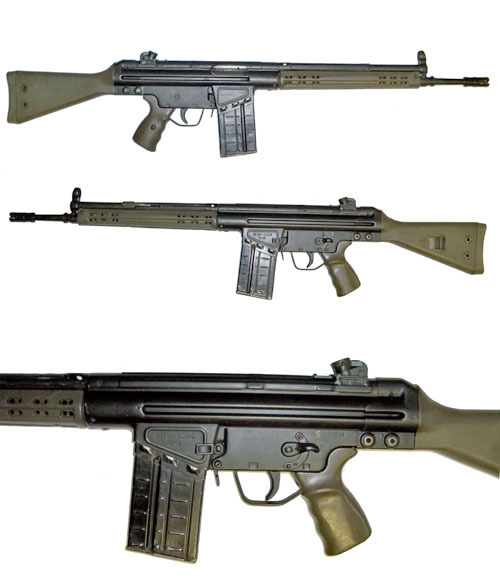 The G3 is an assault rifle developed in the 1950’s by Heckler and Koch (H&K) of Germany in collaboration with the Spanish state-owned design and development agency (CETME). It is chambered for the popular 7.62x51mm NATO round and has been produced under licence by many different countries. The rifle proved successful in the export market, being adopted by the armed forces of over 40 countries and continues to be used to the present day. This example was produced in Portugal by FMP and is manufactured to a very high standard. It is fitted with the green synthetic stock and grip which are often found on these early rifles. It has been deactivated to the latest standard and comes complete with London Proof House certificate and 20rd magazine.